Publicly, it seems like the school system, district, state is in chaos, but walk into a school and you’ll see 101 things that are just amazing,” says Peter Auffant, principal of Shields Middle School in Brighton Park. 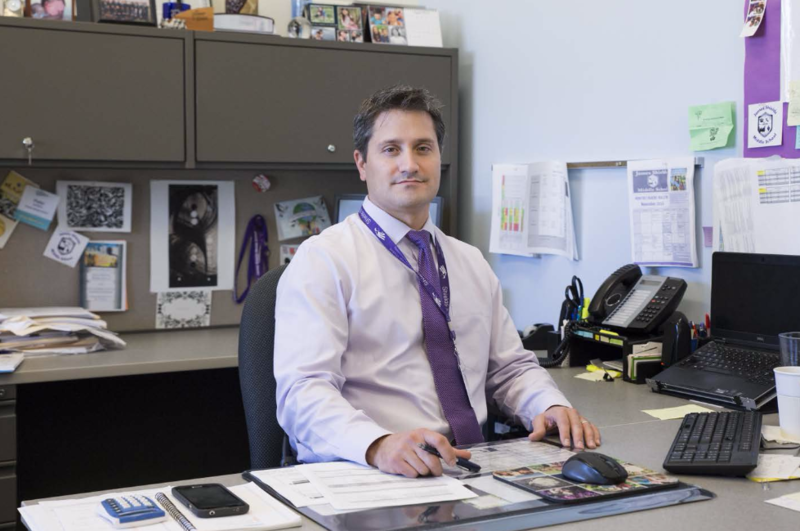 This is his fifth year as principal of the school; he was recently chosen for the Chicago Principals Fellowship funded by the Chicago Public Education Fund (CPEF). CPEF, a nonprofit organization, was founded in 2000 with the aim of accelerating student achievement in Chicago through investments and initiatives in the public education system, according to its website. Governor Bruce Rauner is the director emeritus of its board. In September, CPEF announced the new fellows for its principal professional development programs. Despite Chicago Public Schools’s ongoing budget issues, the continuation of these programs indicates that progress is still occurring in a few areas of public education in Chicago. One of the programs, launched in 2014 in partnership with CPS and Northwestern University, is the Chicago Principals Fellowship. In the twelve-month program, an annual cohort of twenty to twenty-five Chicago public school principals participates in an executive leadership program at Northwestern and receives personal coaching. The fellowship has emerged as Chicago tries to place a larger emphasis on principal training. In 2010, Illinois legislatively required a remodeling of principal preparation programs. However, the state budget crisis has made the goal of attaining “sufficient quantity and quality of principals” difficult to achieve, according to a 2016 report by the University of Chicago Consortium on School Research. Around half of the preparation programs surveyed in the report experienced cuts in funding and staffing, partly due to decreases in overall enrollment and partly due to the state budget cuts. CPEF also recognizes the difficulty schools can have in acquiring high-quality principals: its 2016 School Leadership Report states that over forty percent of schools lose their principal within four years. A 2016 survey of CPS principals also found that one in five plans to leave in the next year, matching the actual turnover rate in past years. Many of the principals surveyed said that their jobs are unsustainable or that they feel unable to carry out school priorities amidst budget restrictions. As a Tribune analysis showed, 443 out of nearly 660 CPS schools will receive less money this year than they did last year. Since then, CPEF has continued to focus on supporting Chicago principals, most recently by funding professional development programs for principals in public schools. Its Principals Fellowship requires participants to commit to working in CPS for at least three more years, as its website states, in order to retain Chicago’s best principals. Given the lack of district-provided professional development, as well as the dissolution of SUPES, the need for these training programs is more apparent. “We live in a schooling environment right now of declining resources and increasing expectations,” says Auffant. Therefore, he says, he has no concern with the role of CPEF in public education. That is why he applied to the fellowship: to “build structures in the school that stay in continued improvement…regardless of the fiscal or political environment.” Specifically, he says he wants to distribute leadership opportunities and responsibility among teachers, parents, and community members, to ensure that multiple stakeholders are capable of helping students when necessary. This is precisely why last year’s cohort of Principals Fellows, when talking with the Chief Education Officer of CPS last year, proposed the creation of a database for principals to share best practices, according to Shenethe Parks, a principal in that cohort. The aim of the database, which is in implementation phase now, is to showcase “the really great things going on in the district,” said Parks, especially in light of the lack of exposure these achievements receive in the media. Parks has been the principal of Bret Harte Math & Science Magnet Cluster School for eleven years. During the Fellowship program, she said she began “to think deeper about the students [she] serves.” As a result, she is incorporating a new social and emotional learning (SEL) class this year, aiming to help students become more self-aware so they can better “control and create their own learning paths,” she said. To further move Bret Harte forward, she is also now participating in the Cahn Fellows Program, another principal professional development program supported by CPEF. Joshua Long, another Cahn Fellow this year, used to work as a speech language pathologist for CPS, and is now the principal of Southside Occupational Academy (SOA), a transition school for students with disabilities who have completed some or all of high school. His project for the Cahn Program is a community-based instruction program that aims to strengthen his students’ exposure to community life. Long hopes to teach students skills including recreation (such as going to the gym), service (such as volunteering at a food depository), and independent living (such as grocery shopping and preparing meals). He plans to add between fifteen and twenty all-day trips in the school year in order to get students out of the classroom and into communities. Each Cahn Fellow engages in a project unique to their work—the Fellows are already accomplished leaders, so the program’s job is “not to teach us how to be principals, but how to become better principals.” In general, the principals chosen for CPEF’s programs are proof of the existing talent in CPS, according to Heather Anichini, CEO of CPEF. Anichini said that despite possible negative images of CPS, Chicago is one of three cities in the U.S. that has actually made progress in public education in recent years—it’s one of the few cities that has continued to see improvement in graduation rates and college entrance rates, for example. Auffant, who is participating in the Principals Fellowship this year, is hence “proud to be a CPS principal.” The fellowship will allow him to make greater improvements in his school, which has already been enacting innovative changes. According to Auffant, this year the school focused on helping students learn strategies to deal with stress from home or from violence in their communities. “Many of our kids are facing adult-sized problems, but they’re still children,” Auffant said. On September 30, Shields held an event to celebrate the practice of mindfulness. All 650 students and numerous community members and parents gathered for a community-wide assembly, said Auffant. Afterwards, they engaged in a “peace walk,” to teach students that if they can find peace within themselves, they can “be a piece of the peace”—an agent to bring peace in the community.